Second, an award from both Minikat and Sharon. To think about what that actually means makes this award quite an honor. In turn, I would like to pass it on to Renee, Jackie, Bonnie, Bettina, Dorothy, Sue, Peg, and Susan. the socks are so fun - what a wonderful idea! Nice socks - nice an toasty warm I bet! Those are really cool socks! How are Catzee and Rascal doing? Yes, very cool socks - those will be fun to wear. T.
the socks look cool - I think I have to make a red pair for myself! 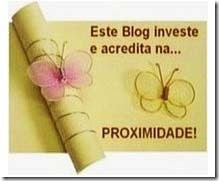 and thank you for the award, Leigh - huh, now I really have to do more on my blog - attack of bad conscience? Love the socks! Congrats on the award. And thanks for all your help. Thanks for the award!!! I really appreciate it!! I've been thinking about those socks of yours - so it's great to see their progress. I've been thinking of them because my one left-over skein of sock yarn, that I was knitting into a multi-directional diagonal scarf - is turning out to not be enough yarn. Thanks for the award & the sock update!!! Thank you for the award :) you are most kind. Your socks look good, very neat knitting. 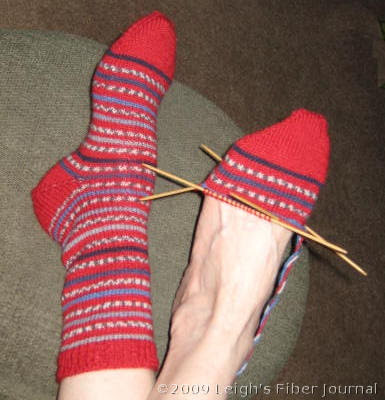 I just knitted a pair that are much too long in the foot, don't know how I got it wrong, but I should have tried them on! Those socks couldn't have turned out better. I am absolutely astonished at the patterns you got by using the two yarns together. I guess toe-up is the only way that would work. Well, you've piqued my interest - I got lots of partial balls of sock yarn and after July, I'll have time!